In its April 1, 1985 edition, Sports Illustrated published an article by George Plimpton that described an incredible rookie baseball player who was training at the Mets camp in St. Petersburg, Florida. The player was named Sidd Finch (Sidd being short for Siddhartha, the Indian mystic in Hermann Hesse's book of the same name). He could reportedly pitch a baseball at 168 mph with pinpoint accuracy. The fastest previous recorded speed for a pitch was 103 mph. Finch, Plimpton reported, had never played baseball before. He had been raised in an English orphanage before he was adopted by the archaeologist Francis Whyte-Finch who was later killed in an airplane crash in the Dhaulaglri mountain region of Nepal. Finch briefly attended Harvard before he headed to Tibet where he learned the teachings of the "great poet-saint Lama Milaraspa" and mastered "siddhi, namely the yogic mastery of mind-body." Through his Tibetan mind-body mastery, Finch had "learned the art of the pitch." Finch showed up at the Mets camp in Florida, and so impressed their manager that he was invited to attend training camp. When pitching he looked, in the words of the catcher, "like a pretzel gone loony." Finch frequently wore a hiking boot on his right foot while pitching, his other foot being bare. His speed and power were so great that the catcher would only hear a small sound, "a little pft, pft-boom," before the ball would land in his glove, knocking him two or three feet back. One of the players declared that it was not "humanly possible" to hit Finch's pitches. Unfortunately for the Mets, Finch had not yet decided whether to commit himself to a career as a baseball player, or to pursue a career as a French Horn player. He told the Mets management that he would let them know his decision on April 1. Sports Illustrated received almost 2000 letters in response to the article, and it became one of their most famous stories ever. 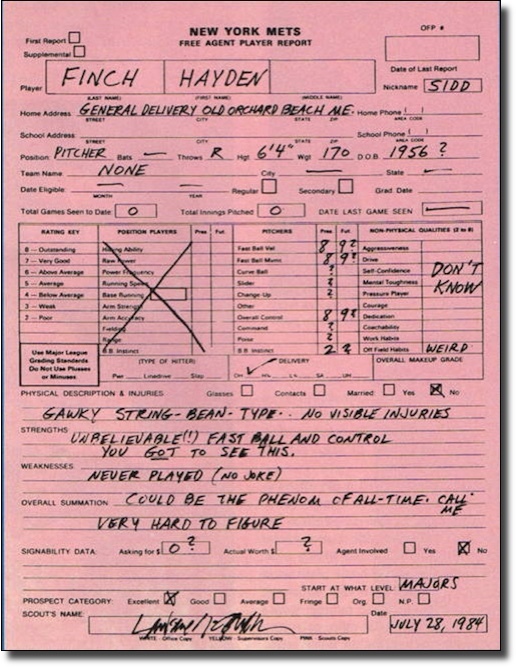 On April 8 they declared that Finch had held a press conference in which he said that he had lost the accuracy needed to throw his fastball and would therefore not be pursuing a career with the Mets. On April 15 they admitted that the story was a hoax. George Plimpton actually left an obscure hint that the story was a hoax within the article itself (the non-obscure hint being that the story was absurd). The sub-heading of the article read: "He's a pitcher, part yogi and part recluse. Impressively liberated from our opulent life-style, Sidd's deciding about yoga and his future in baseball." The first letter of each of these words, taken together, spells "H-a-p-p-y A-p-r-i-l F-o-o-l-s D-a-y." In an odd follow-up, a baseball team in Old Orchard Beach, Maine, after reading the Sports Illustrated article, tried to invite Finch to its annual banquet. They received a reply that read, "The challenge is reaching the Eightfold Path of right belief or the ninth inning with the proper relief. May you have peace of mind." They announced that they interpreted the reply to mean that Finch would be attending their banquet. It is not known whether Finch did attend. No one can hit it. 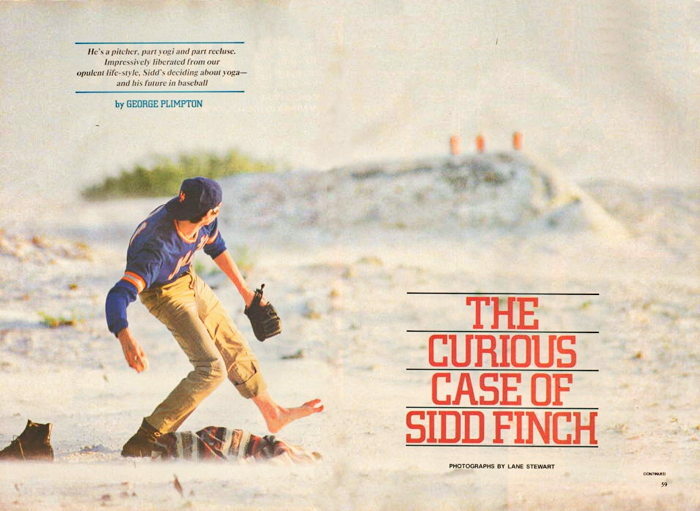 George Plimpton, "The Curious Case of Sidd Finch," Sports Illustrated, April 1, 1985, p.59. John Freeman, "And now, the star of our show...," San Diego Union Tribune, April 15, 1985, D2. George Plimpton, "Welcome to the Dynamite Museum," Esquire, April, 1991, p.62. Fred Fedler, Media Hoaxes, Iowa State University Press, 1989, p.201. When I was in junior high, my applied arts teacher started asking to borrow strange things. One day it was a baseball mitt, the next it was an French Horn. We respected our teachers way back in the eighties and when he gigglingly refused to tell us what was up, several people I knew leant him what he needed for one day. About a month or so later, our classroom was filled with reporters, and my teacher, whose name I could probably look up somewhere but can't remember, was grinning. And we were all happy to have a day off of making clay renderings of our dream houses. We understood that it was big, but only when a restaurant opened in his alias and we all had plenty of time to read the Sports Illustrated article, did we realize how big. My applied arts teacher was Sidd Finch. And that was my friend Trip's French Horn. I happen to be another of the Junior High kids whose shop teacher was the guy who appears in the Sidd Finch photos. If I recall his name was Joe Berton or Bertoncini perhaps. This was at Hawthorne junior high in Oak Park, IL. I remember Joe (Sidd) was helping me make a wooden holder for my Atari joystick. He was a great guy, humorous and lively. Sid Finch was *not* a hoax! He was the real thing. Major League baseball felt threatened that this could destabalize the game. He was kidnapped by government agents. He is believed to be kept in a secret facility at Area 51, where secret experiments are still being conducted. Pete Rose is reported to be involved on the project. His ban from baseball is a ruse to cover his participation. Sidd Finch may have been a hoax, but there was a pitcher who did manage to make it up to 108 mph. And this was when he was tired! Estimates are usually placed that he threw somewhere between 110 and 120 mph. His name was Steve Dalkowski, a lefthander from New Britain, CT who played in the Baltimore Orioles system. He would've been amazing if only he could find the strike zone. He was wild, very wild. He once k'd 262 and walked 262 in 170.2 innings. He wasn't wild in the conventional sense (in and out), though. He threw his pitches sometimes up to 20 feet over the plate. He ruined his arm in 1963. Don't believe me? 1. Do a Google search. You'll find lots of info on this guy. 2. He had a baseball card. 1963 Topps #496. The card is shared with Fred Newman, Carl Bouldin, and Jack Smith. I don't know much about Newman, but Bouldin threw in the low- to mid-90's. Then he wrecked his arm. Jack Smith was a junkballer who just never worked out. Won over 100 minor league games, though, mostly in the Dodgers and Braves organizations. Dalkowski I recently discovered, & is real. How fast he was is unknown, though the above comment that estimates (themselves opure guesswork) threw between 115-120 MPH is innacurate. Looking through MANY sites & articles where he is mentioned, the last # commonly mentioned is 110 MPH-some wisely just say 100+. But there are enough minor & major leaguers, inc. Earl Weaver (who worked w/him patiently, extensively, & pretty successfully) & Ted Williams, sho testify to his unique speed, that I accept he was likely the fastest ever, a genetic freak. For 20 plus years I have been under the impression that the story of Sidd Finch was true. I never saw the April 15th 1985 issue of sports Illustrated that Plimpton had perpetrated a hoax. The part that had me most baffled was Plimpton stating that Sidd played the French horn every bit as well as both Dennis Brain and Anton Horner. Brain and Horner are considered by most to be the two greatest horn players that ever lived. I played the horn professionally and was in shock when I first read the article in 1985. I had never heard of Sidd Finch nor would I ever hear of him again pertaining to the horn. Now I realize why. I have been had! I am partly relieved yet also saddened. Sidd was a great hoax; I remember the story and, a few days later, the revelation. But Dalkowski was real. Google "fastest pitch ever" and you'll find him mentioned among the likes of Bob Feller, who once claimed to have been clocked at 108 mph. No one knows if that's true, but everyone knew enough not to contradict Feller; he'd throw at the on-deck batter if he didn't like the look on his face. In 1994, while operating a small driving range and golf course in Fort Worth, Texas I became friends of the cousin of an employee who was a top-shelf amateur golfer. He was also a country boy as plain as a dozen eggs. Some of you may remember Robert Landers who earned his Senior PGA card in 1994. He played in a flannel shirt, blue jeans and tennis shoes. He looked no more like a golf pro than Snuffy Smith. Why do I post this here? I started calling media, any media, trying to get him some publicity because I knew it would result in some much needed money for my friend. I had called Sports Illustrated several times and could not get anyone to take a call and hear my story. So, I called the next consequitive number I had been given hoping it would be somebody else at the magazine who would listen. It was answered by someone who sounded older than previously, and I asked how long he had been with Sports Illustrated, he said a long time. I asked, "You remember Sidd Finch?" He said of course, I said, "Would you give me five minutes to tell you a story if I swear to God I know a real one?" He said sure. Robert finished sixth and earned his card. Sports Illustrated was there and did a feature story in the Feb. '95 issue. Robert got his 15 minutes of fame and I also got to help him sign an endorsement deal with Dickies for over $60, 000.00 More than he ever made in his life. Turns out Sidd was real after all. Larry Dierker has a spring training story that springs from this. Plimpton had the catchers training to catch Finch by catching baseballs dropped from a helicopter. Larry writes of some player actually trying this, but instead of a baseball, they substituted a grapefruit. When the catcher caught it, it exploded and the catcher, with a face full of hot stickeyness, thought he'd been killed. I'll never forget reading that Sidd Finch piece. I was totally taken in. As a Cardinals fan, all I could think was, "Why the damn Mets?" I too, bought this story, hook, line and sinker! And as a Pirates fan, I too, was disturbed that it was The Mets, who lucked out by "getting" him! I think about this story every April Fools Day! You've left a lasting impression George! It's way cool to see some other people who went to Hawthorne (now Percy Julian). I got to meet the (in)famous Sidd Finch, although sadly I never got to take one of his classes. Still, it was a very cool thing indeed. I do remember this great SI story because I too was a Jr Hi student of the infamous Sidd Finch. He was my woodshop teacher. Ironically, I remember the picture with his bare foot and lanky big toe but I don't remember his real name. Mr. Burton maybe. Oh the glory days of Jr. Hi in the early eighties. It's memories make me smile. I read the story with amazement and couldn't wait to be the first to tell my baseball teammates about this guy! I was going to plan a trip to go to NY to see this guy pitch!!! After I found out it was a hoax, I was relieved that I saved a lot of money! Great story by a great writer! Thanks George!